An Insignificant Man is not only one of the best-reviewed films of the year, but also the most loved. What was previously a well-demarcated niche for Indian cinema is finally finding theatrical validation like never before. 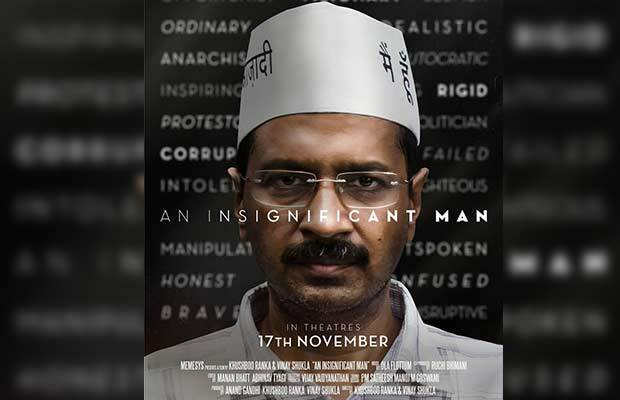 ‘An Insignificant Man’ – a documentary thriller on political wunderkind Arvind Kejriwal – has not only received global recognition but has also been welcomed with standing ovations all across India. Fans of the film are pouring in their exhilaration on Twitter and testifying to the impact of ‘An Insignificant Man’. Furthermore, even top names in Bollywood can’t stop raving about ‘An Insignificant Man’. Directed by Khushboo Ranka and Vinay Shukla and produced by Anand Gandhi (the maker of Ship of Theseus), ‘An Insignificant Man’ chronicles the early rise of the Aam Aadmi Party from a never-seen-before, inside-out perspective. The film has dispelled all assumptions about the political non-fiction genre and has presented itself as taut, gripping thriller that barely lets you blink. Released on November 17th, ‘An Insignificant Man’ is presently running across 33 screens in India. Catch it at your nearest theatre, and be a part of a revolution – in cinema, if not in politics. Next articleBigg Boss 11: Vikas Gupta Accuses Hina Khan Over Arshi Khan And Zubair Khan’s Fight- Watch Video!